Welcome back to the ongoing series of posts about my adventures in playing old games from my childhood. I know that in Part 1 I said next up was going to be Commander Keen: Vorticons, but that is proving slightly more difficult than expected… Instead I completed the classic puzzle game series Paganitzu. 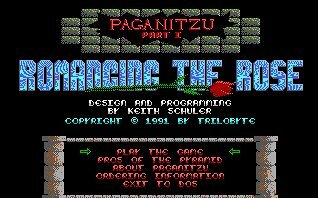 Like many other Apogee games at the time, Paganitzu was released in three parts. Part 1: Romancing the Rose was released as shareware, while Part 2: Quest for the Silver Dagger and Part 3: Jewel of the Yucatan were (and in fact still are) available for purchase directly from the developer. What follows is twenty levels of pushing around boulders, dodging enemy attacks and finding of hidden areas, all while collecting the needed keys to progress through the door to the next level. Some of these levels do require some serious thinking to solve, but the unfortunate thing about this style of game is that its replay value is actually quite low (unless you are searching for all the hidden secrets). With having completed the first part of this game previously, it did not take particularly long for me to get to the end, although a couple of levels did test my levels of recall. 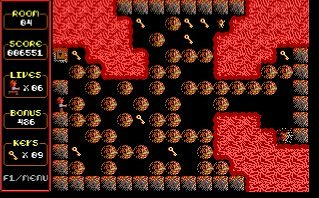 Once you make it through all 20 levels, you are rewarded with a cut-scene in which Al gets his hands on the Silver Rose. Fame and fortune is all his… except he actually ends up releasing the evil god Omigosh instead. Releasing evil gods is usually not a good thing and Omigosh is no exception. He travels deeper into the pyramid and plans to raise an army of undead to destroy the world. Understandably, Al feels a bit guilty about causing impending destruction and decides to go find the Silver Dagger in the aptly named “Part 2: Quest for the Silver Dagger”. While the overall style of the game remains the same, as we delve deeper into the pyramid it has now become hot and lava filled. Along with a selection of new monsters, this gives quite a different feel to part two of the game. The strategies required for solving the puzzles also shift to quite an extent with this change to make the puzzle solving a challenge again. Part 2 rewards you with two cut-scenes. The first happens after you reach the half way point where you first meet the Skull Oracle. He suggests that Al should be sent back in time to bring back the great magician Debasco who originally captured Omigosh in the Crystal Rose. That sounds a great plan, until it is mentioned that only the dead can travel back in time to prevent disturbances being made to the space-time continuum (there is no restrictions on live people travelling forward in time). Somewhat predictably, Al decides to not become dead and take his chances with the Silver Dagger. Onwards for another ten levels, including some quite difficult ones, and our hero makes it to the Silver Dagger. There he meets Omigosh who is now inhabiting the body of some woman whose long dead corpse he found in the pyramid. Al grabs the Silver Dagger in attempt to end the evil Omigosh, but the dagger is too powerful and turns on him. A dead hero and an out of control evil god… who will save us? What a thrilling climax to the second part of the game! What I like about these games is that they are unforgiving. If you can not solve a level, then you are stuck there. The game has judged you and found you lacking. Games these days would have you start in some sort of foyer with entrances to each level, allowing you to skip a few on your way to the end. Sure you can go back and complete the levels you skipped, probably to be rewarded with a different ending, but that just does not give the same sense of achievement in the end. And I say this having abandoned the second game in this series for quite a few days and moved onto the third while I tried to figure out one of the levels that was doing my head in. 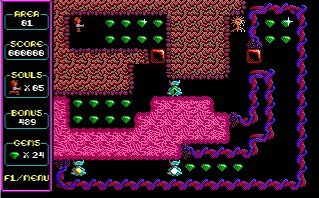 Next up: Commander Keen: Vorticons… or maybe Crystal Caves if those stupid rat like things keep killing me. I can feel your anticipation building! This entry was posted in Games by Allan. Bookmark the permalink.